Before you wait for a ball to drop this evening, think about how much you might drop on today's Nice Price or Crack Pipe 6.5-diesel powered C-10. Then check its price and see if it's worth ringing in the new year with something cool and old. When asked why he robbed banks, career criminal Willie Sutton replied, Because that's where the money is. Money, it's the root of all evil; it can't buy you happiness; and, as espoused by Pink Floyd, it's a hit. Yesterday's 1935 International Harvester C-35 was built to carry money, and to demonstrate that capability, it carried off a narrow 52% Nice Price win for its own monetary demands. For $59,900, Is This 1935 International Harvester C-35 The Money Shot? Yesterday's I-Hopper was old-school cool, but it wasn't very practical nor useful in today's society outside of parade duties or keystone cop movie revivals. In contrast, today's 1965 Chevy C-10 looks ready to do just about anything you could ask of it. Have you ever heard the joke about how a friend is someone you can call and tell that you are in jail; a good friend is someone who you can call and ask to bail you out of jail; and a great friend is someone who's sitting next to you in jail saying, that was awesome!? Yeah, this Detroit Diesel-powered 4X4 (sort of) looks to be that last kind of friend. First off, let's get to the basics, this is a Fleetside, small window (plus two) standard cab pickup with leaf-sprung live axles at both ends, and a serious bad attitude. The engine is a 6.5-litre turbo diesel V8, claimed in the ad to have been liberated from a Hummer H1. In that vehicle the smoker pumped out 195-bhp and a healthy 430 ft-lbs of torque. That of course was considered acceptable for a vehicle that weighed 6,500-lbs. This Chevy should tip the scales at less than 4,000, and hence should be more spritely sprightly. Other mechanical elements are a THM350 gearbox and New Process 208 2-speed transfer case. 4:10 gears send the power to the wheels at both ends - or at least they will once the front driveshaft is hooked up. Power steering and front disc brakes likely make the driving of the truck a little more user friendly. Visually there's a lot to like here. The truck looks to be free of any major structural issues, and comes with a number of paint colors in case you're indecisive. The black vinyl and duct tape interior is carpet-free for hose-ability, while in back a diamond plate 66-gallon fuel tank brings some bling to the bed. The ad notes that all the lights and gauges are functional. The ad also claims the value of the drivetrain alone is over $2,500, which seems reasonable. It also apparently comes with $600 worth of new tires on its mod squad alloy wheels. That's all to prime you for the asking price of the truck overall, which is $4,900, and you now need to decide whether we're going to see 2014 out with a Nice Price win or a Crack Pipe loss. 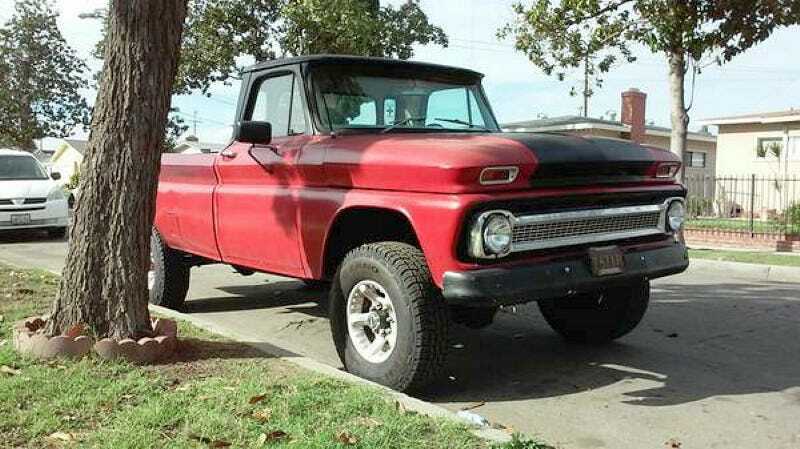 What do you think about this daily driver C10 for $4,900? Is that a price that could have a new owner truckin' in it in no time? Or, for that much is this an old acquaintance that should soon be forgotten?